30 Nov 2018 --- In light of a recent report on “EU Plant Proteins,” the International Platform of Insects for Food and Feed (IPIFF) has combined forces with the European Algae Biomass Association (EABA) to propose a more inclusive EU action plan in favor of alternative protein sources. In this case, algae and insects. Last Thursday, the European Commission adopted a report on the “Development of Plant Proteins in the European Union” intended to explore new pathways in response to the protein deficit in Europe. The document was presented on the occasion of a high-level conference co-organized with the Austrian presidency in Vienna. “As representative organizations for the algae and insect production sectors, we do welcome the European Commission plans to develop plant protein production in the EU. We do however believe that the EU institutions should look beyond vegetal or conventional protein sources, and notably explore possible synergies with ‘new’ proteins sources,” says IPIFF President, Antoine Hubert. Following the reaction to the European Commission report, IPIFF and EABA came together to release a set of proposals and request that the EU takes notice. Firstly the two organizations call for “the establishment of appropriate EU funding measures and cross-sectoral collaborations, through EU research and development projects, tenders targeted at EU industry associations, to foster the upscaling of these emerging industries. All available options to close the current knowledge gaps and barriers to the uptake of these new solutions should indeed be explored,” says Hubert. Secondly, they are “pleading for the launch of EU information campaigns to raise awareness on the existence and advantages of new protein sources while promoting the benefits of eating a variety of protein sources for EU consumers,” he adds. 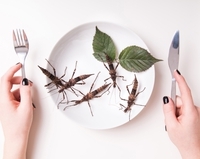 Insect proteins hold potential for global nutrition and have come into the spotlight over the past years as being a good source of healthy protein and several other nutrients, as well as more environmentally friendly in their production than many other animal-derived proteins. The one gallon of water it takes to produce one pound of insect protein pales in comparison to the almost two thousand gallons of water poured into every pound of beef destined for human consumption, for example.